Although there are exceptions to this rule, a lot of the medium format cameras are now significantly more obtainable. The camera above is a Zeiss Ikon which cost me around £8. 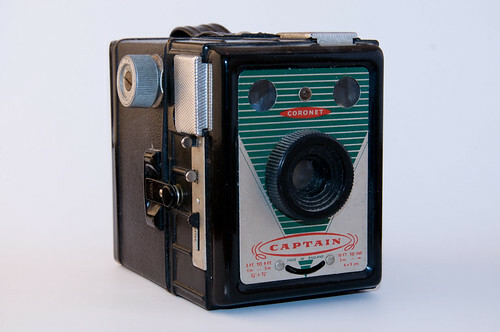 Another camera I laid my hands for a cheap price is the Coronet Captain which cost less than the Ikon at about £5. 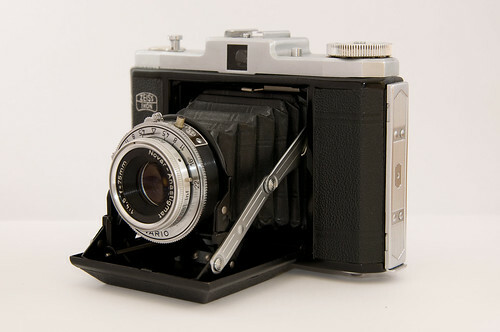 Shown below, it’s a pretty basic box camera, which was made 20 or 30 years ago by Coronet, who are a Birmingham camera manufacturer no longer in operation. It’s dead simple to operate and the photographs which come out are larger than the standard 12 pictures you get on a roll of medium format, and you only get 8. There are two focus settings, the ability to set a timer, or add a green filter – but the best bit are the two view finders which are both waste level. One is for landscape shots and the other is for portrait. Genius! The cameras which have waist level viewfinders create a completely different photograph to cameras which you hold up to your eyes and point and shoot. Images of people are in the middle of their body, and so produce a completely different sense of that person. The quality of the photographs which it produces is very interesting and completely unique, and unique per camera too. Each one will have it’s own little discrepencies in the manufacturing process and could have slight issues with the light seal, which all makes it very interesting. So, if you’re after a new and interesting camera which is simple to get to grips with, cheap to buy and you can throw around as much as you like, here are some to look out for: Coronet Captain, Hasselblad 500c/m, Mamiya C330, Yashica Mat 124G, Lubitel 2.